Ten miles north of Flagstaff is the oldest experimental forest in the United States. 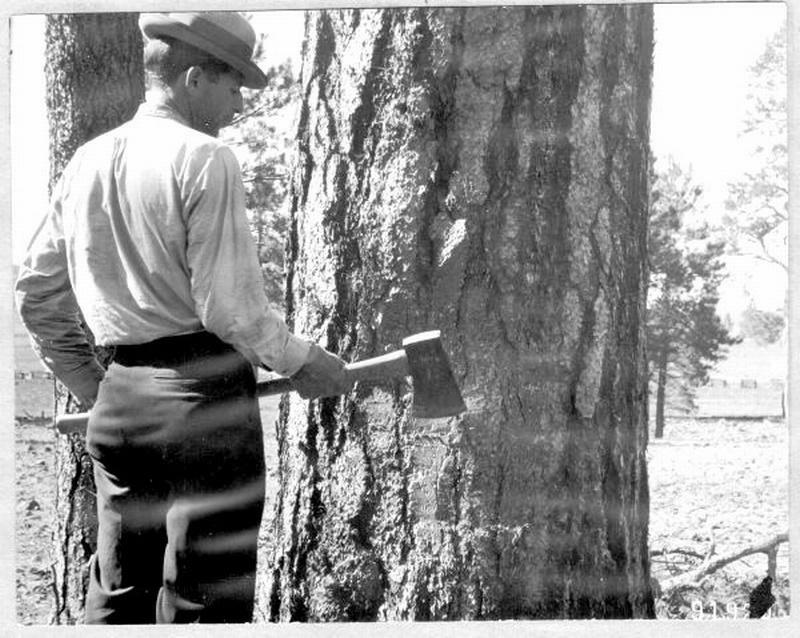 It was established more than 100 years ago at a time when foresters wanted to know how to encourage ponderosa pines to grow. Now, scientists use Fort Valley to study the opposite problem: how to thin the overcrowded woods. It took decades of research to bring about that shift in thinking. KNAU’s Melissa Sevigny reports, it all started with one man and two mules. 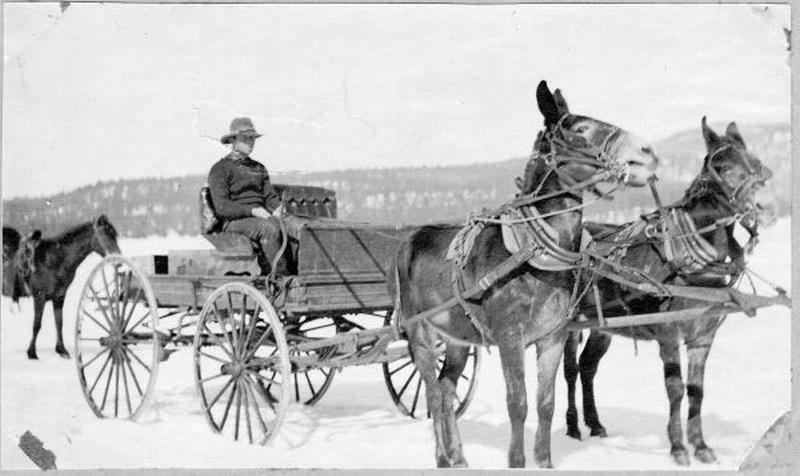 Gus Pearson and his mules Pat and Mike arrived at Fort Valley in the bitterly cold winter of 1908. The mules carried supplies from town to his lonely outpost, where Pearson slept in a shack lit by gaslight. "The structure that he stayed in his way down there, still standing," says local historian Susan Olberding, pointing down the hill at a distant building. "It was just an A frame: a two-room, uninsulated A frame cabin." The U.S. Forest Service sent Pearson to Fort Valley because local lumbermen were worried. No new seedlings had sprouted in clear-cut parts of the forest, and they didn’t know why. Olberding says, "So remember this was 1908, the science of forestry was very young, very new…. When this place opened, the goal was to grow trees, and then cut ‘em." Pearson set up weather stations, fenced out cattle, and planted a nursery. Soon, whole families lived at Fort Valley. Young rangers came to be trained in the one-room schoolhouse. In 1919, a wet spring proved climate was the key. Young pines sprang up everywhere. Forest ecologist Peter Fulé says at first, the seedlings were greeted with joy. "It may have taken one or two generations of foresters to begin to understand there were also threats posed by this very dense forest condition." Fulé says, "Fuels developed, forests became more dense, and fires began to move into the canopies, eventually leading us towards the situation we have today, where severe wildfires present a dramatic threat." 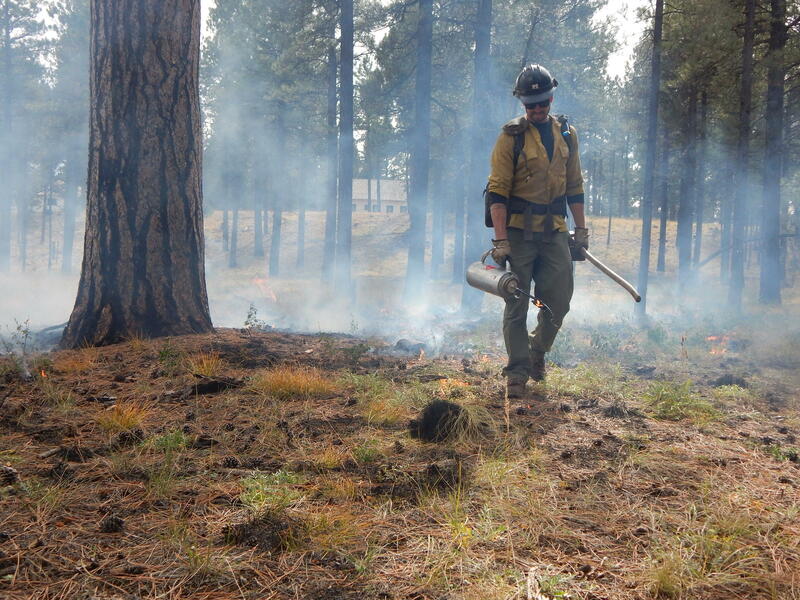 A firefighter ignites a prescribed burn at the Gus Pearson Natural Area. A historic building stands in the background. Today scientists use Fort Valley to learn how to turn back the clock and restore the open fire-adapted forests of the past. Firefighters call to each other over the radio during a prescribed burn. Margaret Moore, plant ecologist at Northern Arizona University, says, "We do an experiment here where we do some thin from below of trees, some thin and prescribed fire, and a control." The plots were arranged to create a buffer around the historic buildings where Pearson lived and worked. But the setup also answers basic questions about forest management. Moore says, "Can we prescribe burn it on a regular basis to control some of the seeding reproduction? Believe it or not, we’re trying to keep this explosion of ponderosa pine regeneration from happening again." 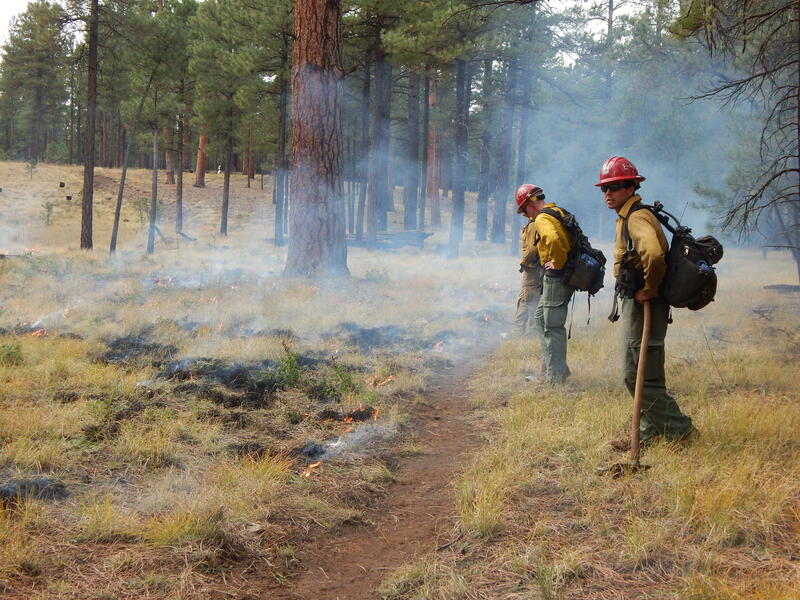 Firefighters monitor a prescribed burn at the Gus Pearson Natural Area. That might have surprised Gus Pearson, but in many ways Moore’s research picks up where he left off. The data from his weather stations is now used in climate change research. Trees in his sample plots are still measured and studied. Keith Moser is the scientist in charge at Fort Valley Experimental Forest. He says, "Even though this was originally intended to basically research: “whack ‘em and stack ‘em, grow ‘em and cut ‘em,” a lot of science from the early 20th century is still very relevant today." Moser’s vision is to restore the historic buildings and have a community of scientists live here again. "The trees have their history built in them. We don’t know what the scientific questions are going to be 100 years from now, but the idea is to have a forest that can be ready to answer them."